The bookstore is literally in the middle of nowhere, among corn and soybeans, yet there are one million books. No sign at the end of the driveway. Only open one day per week. Bad location because there is no foot traffic...or any traffic at all. When I first went there Google Maps couldn't give me directions. A bookseller who frequents the store had to give me directions. Yet in doing everything wrong there's something so right about their business. According to this Business Week article, it looks like this might be the first year that fixed price sales will surpass auction sales at eBay. Speaking only for myself, I know I can hardly tolerate bidding on an auction anymore. I prefer Buy It Now items. Are auctions on their way out? No, not *those* kind of backends. I mean the kind of backend (i.e. upsell) that someone who ships products to customers should use. That someone being you, of course. Over on a forum I participate in there's a discussion about Amazon and how they could sell even MORE books, if such a thing is possible. One of the veteran marketers in this forum said that he ordered a marketing book recently and inside the package was a print advertisement for a Harry Potter book. What a missed opportunity, according to him. Why not instead include a promotion for something similar to what he ordered? It would be far more effective to include a flyer, handwritten note, or a suggestion list for similar books, and offer free shipping or a discount. Maybe even include a prepaid envelope. When someone opens a package it's always a little bit like Christmas and you have a captive audience for a few moments. A special insert like that will increase your sales and repeat business. After all, it's easier to sell to a person who has already purchased from you. Amazon does a great job of sending e-mails with book suggestions and luring you with those "customers who purchased __________ also purchased _________" suggestions on their website. But here's one area where they could improve and where maybe even you could do better than Amazon. If you use backends/upsells in your business, feel free to discuss in the comments what has worked (or not worked) for you. If so, I'd love to hear about that. If not, I'd love to hear about that too. I don't participate in any eBay forums so I'm not as caught up in the drama about this as some sellers are but I do think eBay shot themselves in the foot. They want to make eBay more appealing to buyers but seem to be forgetting that there can be no buyers without the sellers. The sellers are eBay's customers too and should be treated accordingly. If something is ticking the sellers off this badly, I hope they will snap to attention. 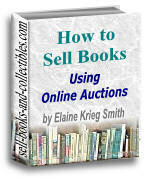 Most of my bookselling efforts are now focused on eBay because the types of books I enjoy selling sell best on eBay. Frankly, going to a library sale and standing in front of a stack of books with a scanner and scanning ISBNs does not interest me. Yawn. I focus instead on books the scanners leave behind because they don't have ISBNs. So I probably should be upset about the eBay changes because they, on the surface, seem to hurt sellers. Bring on the changes! The more dramatic, the better. Changes are a good wakeup call and a reminder that placing your inventory entirely in the hands of eBay and/or Amazon is similar to working for a corporation. You have very limited control. * You have excellent sales skills even though you might be an introvert. * You know how to treat a customer with respect and good manners. * You have an excellent working knowledge of e-commerce. * You might even have learned some HTML basics along the way. Craig Stark recently said over at www.bookthink.com, a transaction takes place between two people. Trust is at the foundation of this transaction, no matter how many changes take place at eBay or Amazon. I'll have more to say about this in the weeks ahead. In the meantime, I'll enjoy the new changes (yep, even the one that doesn't let me leave negative feedback for buyers). Does anyone ever find books on these top ten lists? As you know, BookFinder publishes the top ten out of print books for the year each December. If you haven't seen the 2007 list yet the US list is here and the UK list is here. These lists are very cool and interesting, of course. What I'm curious about, however, is if any of you have ever found one of these books while out scouting? Do you carry these lists in your scouting books? Or do you commit any of these titles to memory? If so, have you ever found one of these books while you've been out and about looking for new inventory? Or have you ever found one through dumb luck, not even realizing it was a valuable title? I'll dutifully print out this year's list and dutifully carry it in my notebook. Maybe this year will be the year I finally find one of the titles. A friend of mine has started selling things on eBay. If you need some entertaining reading, check out her auction for some placemats and a flower art book. I've seen countless eBay listings over the years and almost never have I seen listings as well done as these. I think booksellers especially tend to be rather uptight in describing their books and making sure to use proper lingo like "first edition, first state, with minor rubbing on the dust wrappers." But hardly anyone understands that lingo anyway. Most sellers, especially those with eBay stores, don't use any lingo at all and you're lucky to get a one line description. That flower book only sold for five bucks but I looked it up on eBay and see it has a sales rank of four million and sells for $1 over there. So she did a good job of getting it out the door in a week, whereas it would've sat on Amazon indefinitely and would not have sold for as much as $5.00, if it ever sold at all. She's received a lot of favorable comments about her fun descriptions and at least a few have placed bids just for the entertainment of it all. Way to go! Here's a perfume for book lovers. It's a unique website with fun copy. Be sure to click on "story" so you can read the full description of the perfume. Their other perfumes look good too and are so different from what you see at the perfume counter at Macy's. I'm glad that websites aren't laden with perfume the way women's magazines always are but this is one time I wish I could smell samples on a website.